Trifles are so easy to make and look elegant on your table. This decadent desssert is always a hit at my family gatherings. Bake brownies according to package directions, let cool completely and crumble, set aside. Make chocolate pudding according to package directions, then place in fridge to firm up. Combine pudding with 1 cup cool whip, stir together and set aside. Crush heath bars into small pieces, reserve 1 tablespoon of bars and set aside. 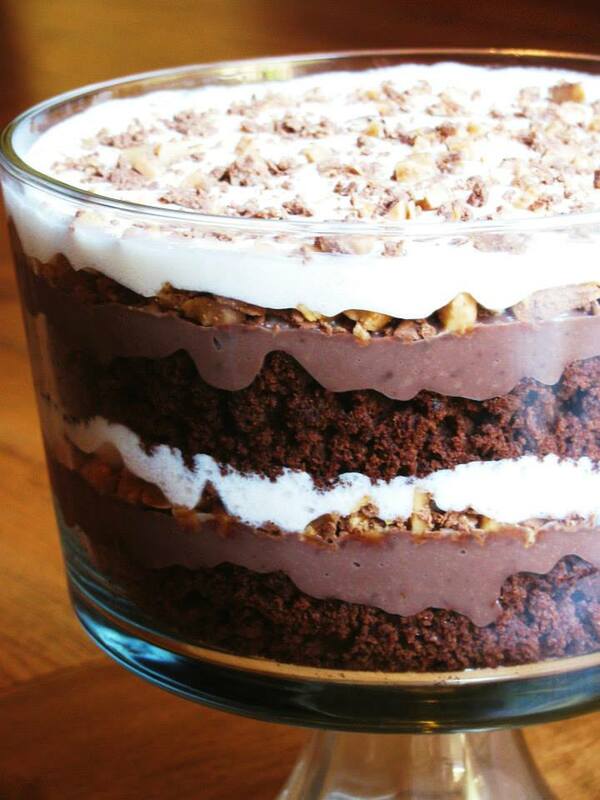 Spread ½ of crumbled brownies in the bottom of a trifle. Layer with ½ of chocolate mixture. Layer with ½ of heath bar. Layer with 1 cup cool whip. Repeat process. Top with remaining 1 tablespoon heath bar. Place in fridge to chill. Oh yum! This sounds like an awesome dessert. I can't wait to try it. This sounds and looks amazing. So simple! I can't wait to bring this to my next family gathering! Another thing to add to my list of stuff to make for my son this summer. He would definitely love this. Whoa... this is dangerous haha I love this and now I think I know what I will be bringing to my mother in laws for easter! I love trifle! I had it for the first time over the Christmas holiday, and it was SO delicious. It was a fruity one though. This chocolate one looks yummy! I love the way this looks. This would be a great Easter dessert. Oh my lands what a to die for dessert!!! This looks so good. Oh my gosh - that looks absolutely divine! My son has allergies to dairy, eggs, and nuts but I bet I could an allergy-friendly version of this! Thanks for the ideas! Trifles are fantastic. You can make them out of so many ingredient combinations. And they always look so appealing. Oh that looks heavenly! I wonder if heath bars are gluten free... That is a must try recipe for sure! That looks yummy!! There are a lot of options to mix it up as well. I can almost taste this. So yummy! hmmmm. Love it! My family loves any dessert with chocolates! I will definitely try this one of these days. Thanks for sharing! Wow! That looks amazing! I can see why its a big hit at family gatherings. It sounds like its pretty easy to make too. This is torturous for a pregnant woman! It looks so delicious! That looks so amazing! I always love a good chocolate dessert. That's one of my favorite comfort food. I love that the recipe is easy to follow so I won't have a hard time making this! Yes, please! My husband is English and loves a good trifle, but I've never made one. This could be his lucky day... thanks for sharing! Looks so amazing and rich! Wanna give a try. I can't wait Thanks! That's just naughty in the very best of ways. I'm totally craving it now! You had me at Heath. I love toffee and chocolate together. Totally pinning this now. This looks so decadent and wickedly delicious. I would love it. This looks so good. I will have to try this recipe for the family. Omg this sounds beyond amazing!!!! I so need this in my life! Yummy! I have never made one of these before and didn't know the name of them until a year or two ago. They do look pretty and they taste amazing! I have always wanted to try trifle! This looks amazing and simple to make. Looks delicious! And my family loves anything brownie, so I will need to try this out. Thanks! Trifle is my weakness, used to eat them weekly when I lived in England! I love the way that a trifle looks, but I've never made one myself. This is a cool recipe because few ingredients are required.